I have to admit, I find teaching pragmatic skills to be one of the toughest parts of my job! 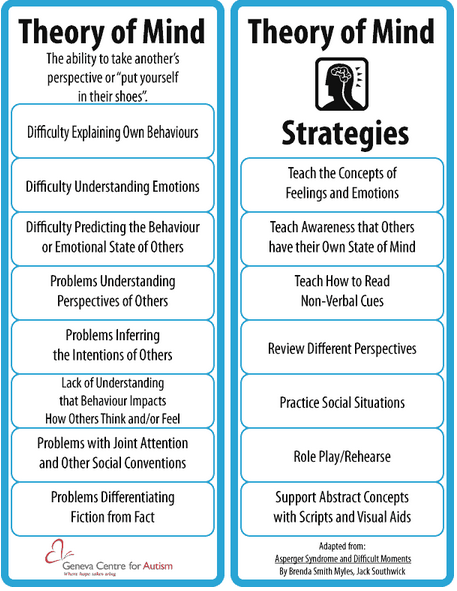 When planning for clients with pragmatic needs, I like to keep this framework in mind (from the Geneva Centre for Autism). It is important not to think of the Theory of Mind strategies as being hierarchical; although you may plan to start teaching from the top of the list and work your way down, you can't actually parse these skills apart entirely. Social interactions (especially kid-kid interactions) rarely ever "make sense" or follow social rules - We teach kids not to interrupt, and yet that is the norm in most conversations (think about it the next time you speak with someone - unfinished sentences, bouncing around between topics and filling in the other person's thoughts, and other "social rule-breaking" behaviors are actually the norm). And yet, the go-to method for teaching pragmatic skills is through rigid social scripts. While this strategy works for some basic skills, it isn't one that will easily grow with them and apply to situations with the necessary flexibility. 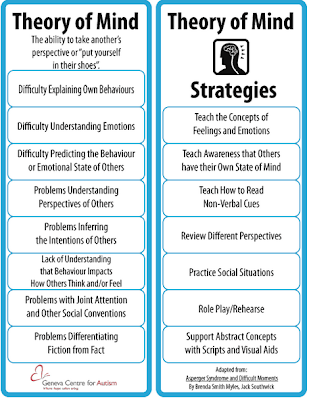 Jill Kuzma's site has wonderful resources for all things related to pragmatics, including an overview of some of the assessments used in the Social Thinking program. I think this is a great place to start (and stay to browse for a few hours)! So now that I've introduced my perspective on pragmatics, I'll give a run-down of a typical lesson. Bear in mind, I work in a public school with small groups of students typically for 30 minutes weekly (pull-out) - Not always an ideal setting, but its what I have to work with. I think introducing a topic with a video is always a great idea. 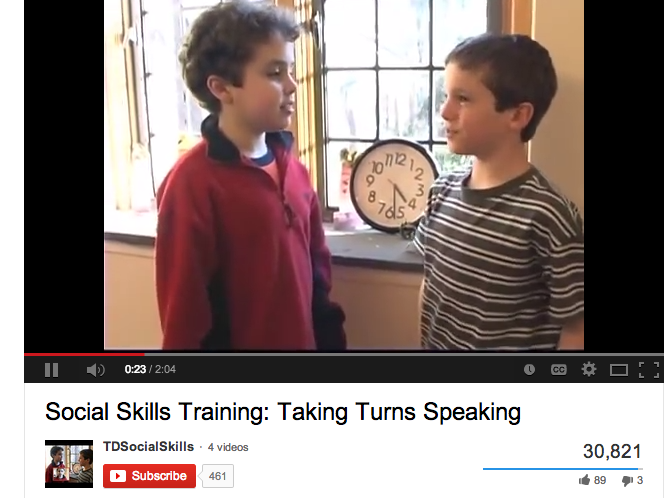 This one on conversational turn-taking works with most of my students. Whether I show the video in entirety or just fast-forward to the role-playing depends on the level of need. I'll pause the video before the instructor explains what is going on to give the kids a chance to brainstorm what is going wrong in the conversation and what could be better. After the video introduction, we talk about why is is important to stay on topic in a conversation (people like to know that we are thinking about what they feel is important, talking about the same thing helps build connections between ourself and another person, etc). We also brainstorm the nonverbal clues that let someone know we are listening (body positioning, thinking eyes, etc). Then we'll transition to a structured activity to practice the skill. I think it is best to target the skill in a structured context first before trying it out in a role play scenario. I like this activity from TPT: Monsters Make Sense, made by Miss Speechie. See SpeechTimeFun for a review of the game. 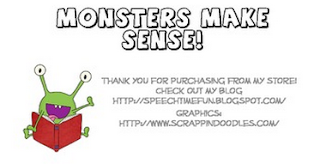 If you don't feel like forking over the $2.75 for Monsters Make Sense, try this freebie from SLPmaterials. I like that it asks the students to add a relevant comment or question in order to join the conversation - That's the hardest part! Ask Me Two Questions (also from SLPmaterials) is another good freebie. I love using my iPad to video record the interactions so we can review them afterwards. Sometimes the students can tell you exactly what they need to do in order to be successful, but they don't actually make the corrections until they see it. We'll review the turn-taking rules and discuss how we will measure success. 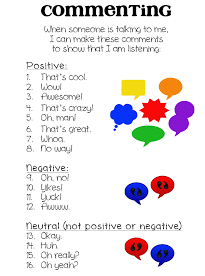 I like to generate a rubric with the students that we can use to evaluate the recorded interaction. This way they feel some investment and ownership over the activity. Making the rubric together also gives the students a good opportunity to show what they've learned from previous lessons (like using thinking eyes, body positioning, etc.). I use these comment/question visuals with the students as a reminder that they need to contribute to the conversation in different ways. I'll give each student 3-4 of each to put in the middle of the table as they are used. At the end of the role-play, this provides tangible evidence of the balance (or imbalance!) of conversational turns. Some of my students also need access to a list of common comments as a reference. And that's it! Opportunities for "real-life" practice with guided reflection - paired with lots of repetition (we could probably do this lesson 25 more times) - is the key for making changes!